There is one post tagged Slack. 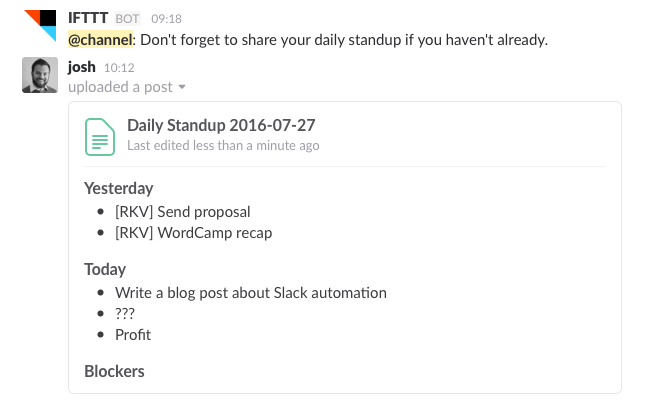 At Reaktiv Studios, we do our daily standup in Slack, rather than a meeting due to the remote nature of our team. There’s a separate channel #standup where we use a Slack post to outline what we accomplished yesterday, what we plan to accomplish on today and any blockers we’ve encountered. 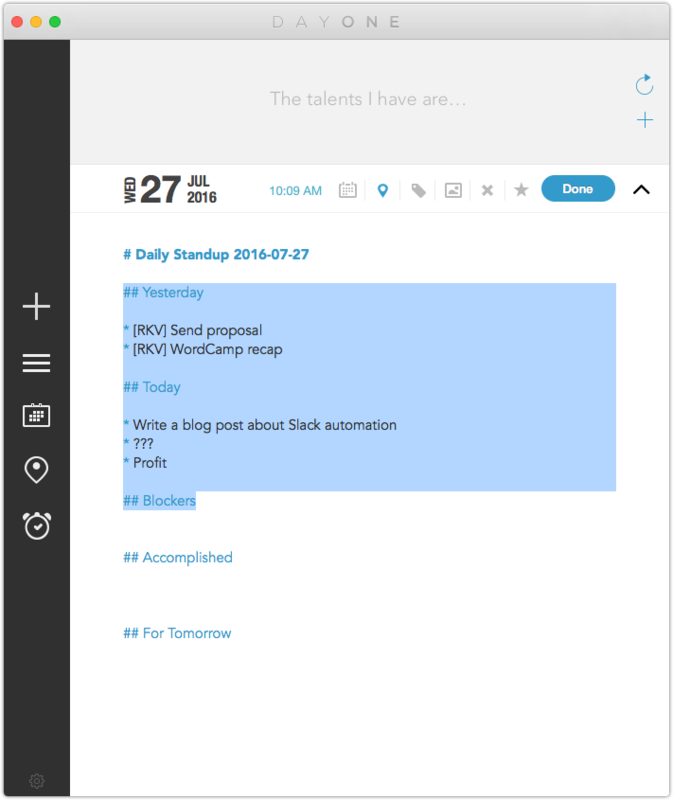 I was already keeping a daily work log in Day One, a fantastic journaling app for OS X, and wanted to sync up my workflow so I didn’t have to spend more time formatting a post in Slack, or deal with copying and pasting between the two apps to share my standup. It seems Slack has changed to use Oauth for all apps, but I have heard that creating a “test token” on this page still works. Pull the list of channels in the tester and search until you find your channel name, above it will be the channel ID. You can name these however you want, just be sure to change them in the script below as well. 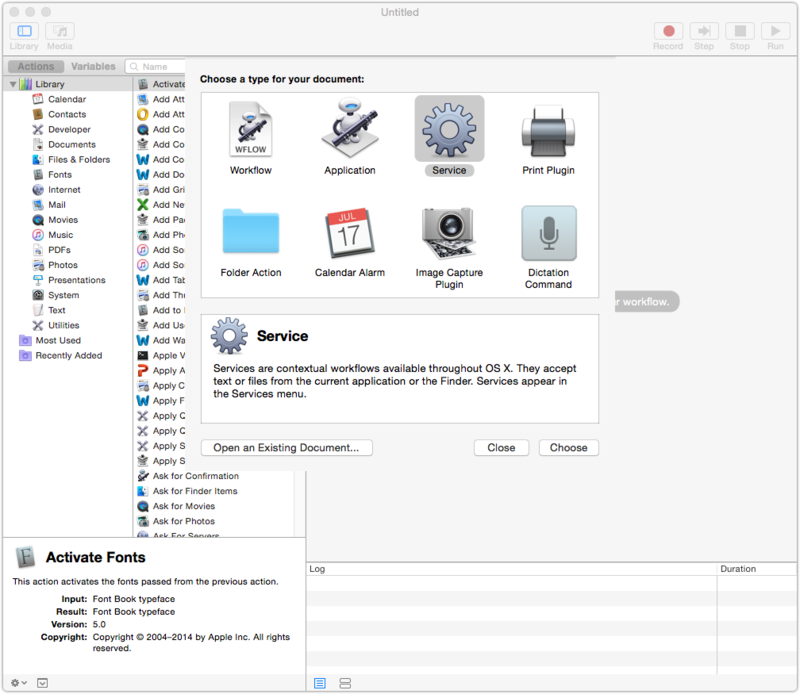 Open Automator, and create a new “Service”. Choose the “Run shell script” action. First, we source our Slack credentials file. 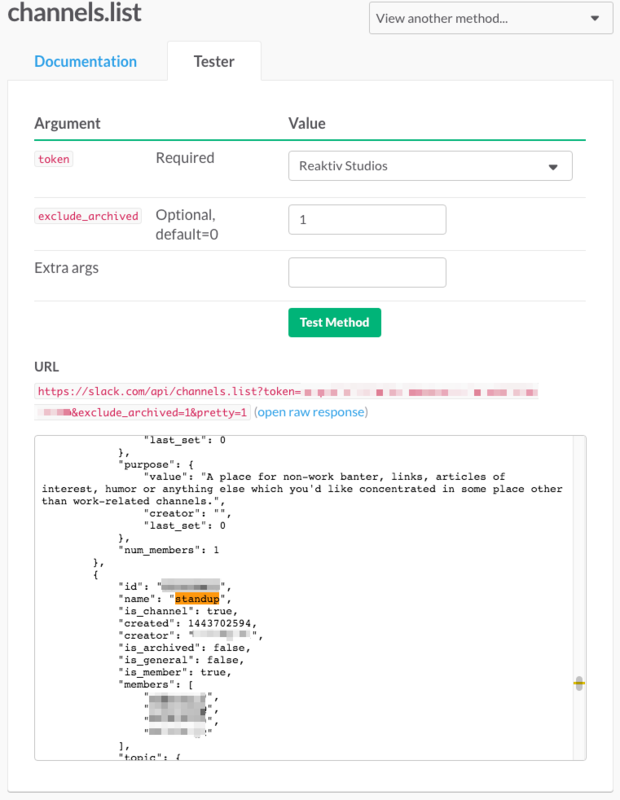 This makes the SLACK_TOKEN_RS and SLACK_CHANNEL_STANDUP variables available to our script. We then make a curl request to Slack’s files.upload endpoint. We are submitting this as a multipart/form using the -F flag. -F token=$SLACK_TOKEN_RS sets our API token from the credentials file. -F filetype=post this is what creates a Slack “post” rather than a media file upload. -F channels=$SLACK_CHANNEL_STANDUP sets the Slack channel to share the post to. -F title="Daily Standup `date '+%Y-%m-%d'`" sets a dynamic title based on today’s date. 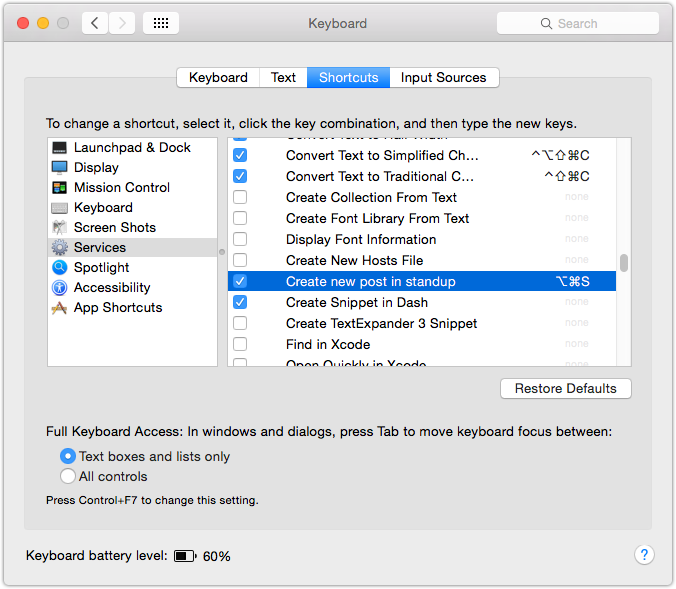 Save the service, and then open Preferences > Keyboard > Shortcuts to assign a keyboard shortcut. I have assigned ⌘⌥S as the shortcut. That’s it! 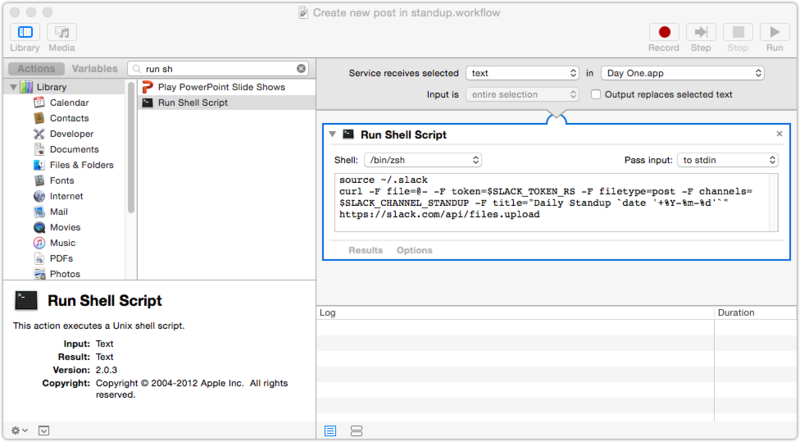 Now you can test your Slack integration by selecting some text and hitting your keyboard shortcut. Your post should appear in Slack. You could use this from any app, not just Day One. Let me know if you’ve found this helpful or what other interesting Slack integrations you’ve made!